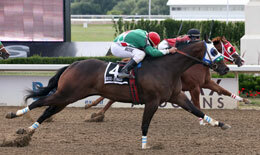 Ivory Injun (#4) holds off Zip Code (#3) in the All Canadian Futurity at Ajax Downs. AJAX, ONT�JULY 30, 2013�22-1 long-shot Ivory Injun would not be denied as he upset a full field Tuesday afternoon in the $52,694(US) All Canadian Futurity at Ajax Downs. Under jockey Daniel Rose the bay gelding broke on top and held off Zip Code by a neck. Reckless An Wild put in an impressive effort to finish three-quarters back in the show position. Ivory Injun broke his maiden by completing the 350 yard course in :17.900 seconds. The $21,077(US) winner's purse swelled the bay's bankroll to more than $23,000. Renee Wilson saddled the IVORY JAMES gelding for owner Ivy Lane Racing. Bobby D. Cox bred the bay in Oklahoma from the Invisible Injun mare Powerful Injun. He kicked off his career on June 25 with a third place maiden effort. Ivory Injun finished 1 � lengths behind Zip Kode in the July 9 All Canadian Futurity trials while posting the fifth fastest qualifying time. After shipping to Canada from Remington Park last June, Zip Code had reeled off two daylight victories in a maiden effort and his trials race. Steve Hunter's Bigtime Favorite filly dueled all the way Tuesday afternoon but could not overtake the leader and settled for a place check worth $10,539(US). Janet Grice saddled the sorrel miss with Chelsey Willick getting the riding assignment. Also bred by Bobby Cox, in partnership with John Buchanan, the Texas-bred is out of Fee Lion by Panther Mountain. She is 2-1-0 in five starts and has made $16,523. Another long-shot, Reckless An Wild paid backers $5.60 to show. The Ontario homebred Wild Boyz gelding races for Gary and Marlene McNichol. David Ward conditions with John McInerney riding. He earned $5,269(US) to push his earnings total to $7,157. Winless in three starts, Reckless An Wild is out of the Reckless Dash mare Reckless Wish. Completing the field were post-time favorite and fastest qualifier Cold Hearted Shark 4th, followed by Totally Nuts, Silkin Memories, Holey Foose, Runaway Cause and Va Va Vrroom. Editors note: A photo of this race will be posted when it becomes available from the track photographer.